Photo Courtesy Of The California Rangeland Trust OPENLY PROTECTED Keeping its rich history intact, the Avenales Ranch celebrates its official conservation. 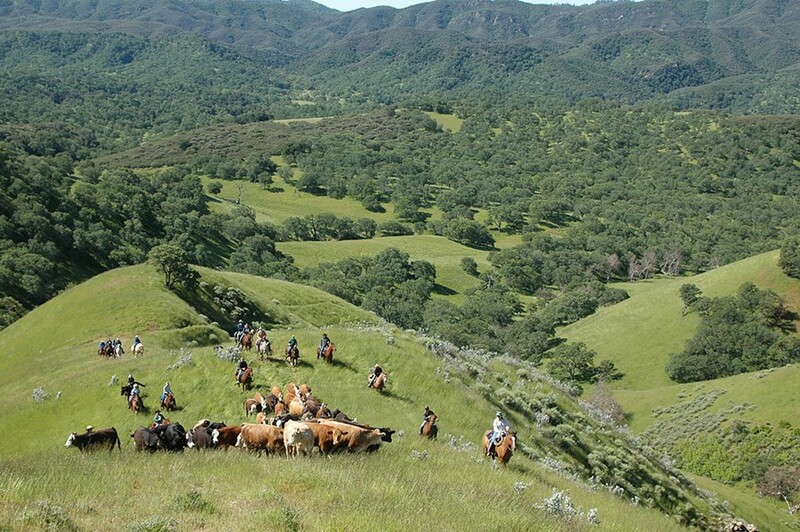 About 20 miles east of the city of San Luis Obispo lies about 12,200 acres of newly protected rangeland. As of this month, the Avenales Ranch in Santa Margarita is now part of the 300,000 acres of land conserved by the California Rangeland Trust. Its protection was ensured by a conservation easement—a voluntary legal agreement between a landowner and a land trust that permanently limits uses of the land in order to protect its conservation values. After seven years on the organization's waiting list, the ranch is now conserved by a partnership between the California Rangeland Trust, Wildlife Conservation Board, and the Rocky Mountain Elk Foundation. Nita Vail, CEO of the California Rangeland Trust, said preserving the land not only benefits the ranchers but it also benefits the surrounding community as well as adding to its rich history that dates back to the 1880s. "The Avenales Ranch is a prime example of the importance of conserving California's rangelands to protect clean air and water, wildlife, and healthy local food we all cherish and depend upon," Vail said. The ranch has been home to six generations of the Sinton family, four of whom are still running the ranch. Rancher Jim Sinton was given the land on behalf of his grandfather who purchased it 129 years ago. "We are stewards of the land at the Avenales Ranch," Sinton said. "Our stewardship should leave the land in better condition than we found it." The land now belongs to Sinton's grandchildren. Together the family filed an application with the California Rangeland Trust for a conservation easement to ensure the ranch will remain working rangeland. Throughout their ownership the family has managed and sustainably maintained the native grasslands and oak woodlands that support their cattle ranching as well as native wildlife. Some species found living in the acreage include the California red-legged frog, Tule elk, and the California condor. Of the three, the animal unique to the ranch is the Tule elk, currently categorized as an endangered species. The elk were reintroduced on the ranch 25 years ago, and while there are fewer than 400 left, those that live on the ranch are thriving. The California Rangeland Trust is a nonprofit organization founded by a group of individuals from the California Cattlemen's Association. The association was formed in 1917 in San Francisco and later moved its headquarters to downtown Sacramento. The group is a nonprofit trade association representing California's ranchers and beef producers in legislative affairs. The organization was formed to conserve another important aspect to ranchers: their land. The trust works to preserve open space, natural habitat, and stewardship. To date, the organization has been able to permanently protect 310,497 acres of privately owned rangeland, which translates to 63 ranches with 95 additional projects awaiting conservation funding. The four Kennedy Club Fitness locations in SLO County are offering annual specials along with free local guest days for non-members, during the month of October. The offer comes on the heels of the fitness club celebrating its 36-year anniversary. For more information visit kennedyclubs.com.